What’s the airline industry’s idea of a cruel joke? Making all passengers walk through first and business class on their way to their smaller, nondescript coach seats in the back. For one brief moment, you imagine what it would be like to have a wide seat with lots of legroom, free drinks, and personal service, and then you pass through the curtain into anonymity to tough out a few hours with the masses. Upper class doesn’t have to be out of your reach. Many of the travelers sitting up front are not millionaires but frequent travelers and savvy flyers. If you really want to fly first or business class for less, read our top five tips for sitting up front without spending a fortune. Elite flyers are the VIPs of the airline. They get exclusive check-in lines, the right to board the airplane first, and special perks including complimentary upgrades to first or business class. Some airlines will upgrade elites on every flight as long as there are unsold upper-class seats, while others give out certificates redeemable for a confirmed upgrade. If you want to sit up front without paying the high fares, elite status is the way to go. But while you may not have to pay for upgrades, you do have to pay your dues to attain elite status. Most airlines require you to fly 25,000 miles in one year to attain the lowest elite tier. The average leisure traveler may not fly that much in a year or won’t take every trip on the same carrier if other airlines offer lower fares. If you really want to earn elite status, you will need to choose a preferred airline and only fly that airline in order to rack up enough miles. However, there are some tricks for getting elite status without flying 25,000 miles. Airlines often have promotions that award elite status for completing certain activities within a specific time frame. At the time of publication, Delta is offering Silver Medallion elite status to SkyMiles members who take one flight departing from select cities. You can also take the fast track to elite membership by requesting and completing an elite challenge. Challenges are unpublicized promotions that allow you to earn elite status by flying a certain number of flights or miles in a limited amount of time. Not all airlines offer them to all members, so you’ll have to call your airline’s frequent flyer customer service center to find out. The trick with challenges is that you must sign up for one before you take any of your qualifying flights, so you should be pretty sure that you can fly the necessary amount before you enroll. You have two ways to get your frequent flyer miles to bump you to the front of the plane. First, you can earn enough miles for a free first- or business-class flight. You’ll need between 40,000 and 60,000 miles to fly up front on a domestic flight. Your second option is to use your miles to upgrade a coach seat. The average cost is 15,000 miles to upgrade a one-way flight. Full-fare economy tickets can be upgraded for fewer miles. Be aware that some of the most deeply discounted economy fares can’t be upgraded at all, while others require a copay. If you’re planning on purchasing an upgrade with miles, be sure that you know the rules associated with your ticket before you buy it, so you’re not unpleasantly surprised when you find out how many miles and dollars you’ll need to shell out. In general, you will get more value from your miles if you use them for upper-class seats. When we checked, a September flight from New York to Los Angeles in coach cost $343. The cost per mile for the 25,000-mile award was 1.4 cents. However, a first-class flight on the same dates cost $1,194, and the 45,000-mile award is valued at 2.7 cents per mile. In this case, your miles are worth twice as much if you use them for a first-class flight, and you will value that flight so much more for the added comfort and service. If you don’t have the miles or the status to get to the front of the plane without paying, you can get away with upgrading for less. Many airlines offer standby upgrades that allow you to upgrade a coach ticket on the day before or the day of your flight. For example, Delta and America West offer reasonably priced upgrades, starting at $50 per flight leg, and low-cost carriers ATA and AirTran offer upgrades on their already low fares, starting at $30 or $35 per leg. Check with your airline to determine when you can confirm an upgrade and how much it will cost. You can also get upgraded for free if you are willing to pay for the most expensive coach tickets. US Airways offers GoFirst fares, which are full-fare economy tickets that receive automatic upgrades to first-class on a space-available basis. America West also offers fully refundable fares in economy class Y that include free upgrades. Several other airlines have similar policies, but the upgrades are limited to elite flyers. Full-fare economy tickets can be significantly pricier than deeply discounted economy and sale fares. However, they are cheaper than buying a first-class ticket, and in that way they can be handy for travelers who want upper class at a lower cost. As a last resort, you can always buy a first- or business-class ticket. If you don’t want to take out a second mortgage to do so, you should choose your airline wisely. America West claims that its first-class fares are 40 to 70 percent lower than the industry average, and its cheapest upper-class fares start at $189 each way. 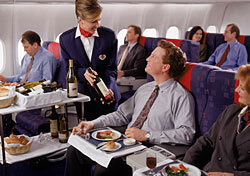 US Airways and Delta have capped one-way first-class fares as part of their simplified pricing structure. US Airways’ domestic GoFares are at most $499 each way, and Delta’s domestic Simplifares won’t cost more than $599 each way. You can also try low-cost carriers with upper-class cabins, such as ATA and AirTran, for lower prices as well. Your cheapest option will always be to grin and bear it in coach, but if your goal is value, a free or cheap upper-class seat will make your flight that much more enjoyable. Put these tips to use, and you (not the airline) will have the last laugh as you fly away in style with money left in your wallet.